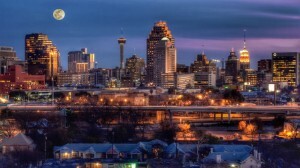 San Antonio is the second largest city in the state of Texas and the seventh largest city in the United States. The city is characteristic of other Southwest urban centers in which there are sparsely populated areas and a low density rate outside of the city. It was the fourth-fastest-growing large city in the nation from 2000-2006 and the fifth-fastest-growing from 2007 to 2008. Its metropolitan area has a population of 2,031,445 based on the 2008 U.S. Census estimate, making it the 28th-largest metropolitan area in the U.S and third in Texas (behind Dallas and Houston). The city is the seat of Bexar County with a population of 1,622,899 as of the 2008 U.S. Census estimate. The city was named for the Portuguese St. Anthony, whose feast day is on June 13, when a Spanish expedition stopped in the area in 1691. Located in the northern part of South Texas and the American Southwest, San Antonio is the epicenter of Tejano culture and Texas tourism. Famous for Spanish missions, the Alamo, the River Walk, the Tower of the Americas, and host to Seaworld and Six Flags Fiesta Texas theme parks, the city is visited by approximately 26 million tourists per year according to the San Antonio Convention and Visitors Bureau. The city is home to the four-time NBA champion San Antonio Spurs and the annual San Antonio Stock Show & Rodeo, one of the largest in the country. In 1536, Álvar Núñez Cabeza de Vaca, a shipwrecked captive of Native Americans, visited the interior of what would later be called Texas. He saw and described the river later to be named the San Antonio. In 1691, a group of Spanish explorers and missionaries came upon the river and Native American settlement (located in the area of present-day La Villita) on June 13, the feast day of Saint Anthony of Padova, Italy and named the place and river “San Antonio” in his honor. In 1716, The Spanish Council of War approved a site on the San Antonio River for construction of a presidio (fort). The Domingo Ramón expedition, accompanied by the trader St. Denis from Louisiana (who had come to the site two years previous) established a presidio on the river. That council also approved a request by Father Olivares to establish a Catholic Mission at the site. In 1718, Martin de Alarcón, then Governor of Texas, reinforced the presidio and the ten soldiers and their families were recognized officially as the beginning of the villa. Alarcón named the presidio San Antonio de Béjar in honor of the Duke of Béjar, in Spain, the viceroy’s brother, who died what was considered a hero’s death defending Budapest from the Ottoman Empire in 1686. In 1721, The Marquis de Aguayo moved the presidio San Antonio de Béjar to its present site on the Plaza de Armas, where permanent quarters were constructed for the soldiers. In 1726 the official settlement population was 200, including 45 military and their families. The Mission San Antonio was moved to its third and final site on Alamo Plaza in 1724 because of hurricane flooding at the previous location. At eleven o’clock on the morning of March 9, 1731, sixteen families (56 people) from the Canary Islands, often referred to as the “Canary Islanders,” arrived at the Presidio of San Antonio de Bexar in the Province of Texas. By royal decree of the King of Spain, they founded La Villa de San Fernando and established the first civil government in Texas. The Marquis of Casafuerte, Viceroy of Spain, (King of Spain) bestowed upon each Canary Island family titles of nobility. Many descendants of these first settlers still reside in San Antonio. San Antonio grew to become the largest Spanish settlement in Texas. After the failure of Spanish missions to the north of the city San Antonio became the farthest northeastern extension of the Hispanic culture of the Valley of Mexico. It was for most of its history the capital of the Spanish, later Mexican, province of Tejas. From San Antonio the Camino Real, today Nacogdoches Road in San Antonio, ran to the American border at the small frontier town of Nacogdoches. After Mexico achieved independence in 1821 American settlers, at the invitation of the Mexican government, began to settle in Texas in areas northeast of San Antonio. When Antonio López de Santa Anna unilaterally rescinded the Mexican constitution of 1824 violence ensued in many provinces of Mexico. In Texas the anglo settlers joined many Hispanic Texans in calling for the return to the constitution of 1824. In a series of battles the anglo Texans, who called themselves Texians, succeeded in forcing Mexican forces out of the anglo settlement area. Under the leadership of Ben Milam, in the Battle of Bexar, December, 1835, Texian forces captured San Antonio from forces commanded by General Martin Perfecto de Cos, Santa Anna’s brother in law. This gave the forces opposing Santa Anna control of the entire province of Texas. Today Milam Park and the Cos House, commemorate this battle. After putting down resistance in other regions of Mexico, in the spring of 1836 Santa Anna marched on San Antonio. Texian leader Sam Houston, believing that San Antonio could not be defended against the regular Mexican army, called for the Texian forces to abandon the city and join him. A volunteer force under William Barrett Travis, newly arrived in Texas, and including James Bowie, Davy Crockett and his company of Tennesseans, and Juan Seguin’s company of Hispanic Texan volunteers, occupied and fortified the deserted mission, the Alamo, and determined to hold San Antonio against all opposition. The Battle of the Alamo took place from February 23 to March 6, 1836. Santa Anna, without waiting to bring up his heavy artillery, hurled his troops against the walls of the fort in mass assaults. These were carried out with great courage by the Mexican troops and were repelled with equal courage by the defenders of the Alamo. The defenders of the Alamo included both anglo and Hispanic Texans who fought side by side under a banner that was the flag of Mexico with the numerals “1824” superimposed. This was meant to indicate that the defenders were fighting for their rights to democratic government under the Mexican constitution of that year. It was only during the siege that the Texas Congress declared an independent Republic of Texas. After 13 days the 189 Texan defenders were overwhelmed by a final assault from the 4,000 Mexican troops led by Antonio López de Santa Anna. Those defenders who were captured were executed as rebels on the specific orders of Santa Anna. While legally entitled to do this, the deaths of these “Martyrs to Texas Independence” inspired greater resistance to Santa Anna’s regime, and the cry “Remember the Alamo” became the rallying point of the Texas Revolution. Texas independence was finally attained at the Battle of San Jacinto the following April. The Alamo, which was in 1836 across the San Antonio River from the city, is now an integral part of downtown. Alamo Plaza contains the Cenotaph, a monument built in celebration of the centenary of the battle; it covers the remains of the Heroes of the Alamo, and bears the names of all who fought there on the Texan side. The Alamo is maintained as a shrine and museum, surrounded by many hotels and tourist attractions. It is clearly San Antonio’s best known landmark, and is featured in the city’s flag and seal and in the city’s nickname, “The Alamo City.” Across the street from the rear of Alamo is the world famous Crockett Hotel, named after the legendary pioneer Davy Crockett. Among the Hispanic Texans, Tejanos who fought on the side of the Texas independence forces, was Juan Seguín. He was elected to the Texas senate following independence, and later served as mayor of San Antonio. He was forced out of that office at gunpoint by Anglo politicians in 1842. The next Hispanic mayor would not come until Henry Cisneros was elected in 1981. In 1845 the United States annexed Texas and included it as a state in the Union. This, after some incitement by United States troops along the Mexican border, led to the Mexican War between the United States and Mexico which concluded with the Treaty of Guadalupe Hidalgo, 1848. Under this treaty Mexico ceded to the United States not only Texas but California, New Mexico, Arizona, and all of what is now the American Southwest. The war was devastating to San Antonio, and at its end the population of the city had been reduced by almost two thirds, to only 800 inhabitants. Peace and economic connections to the United States restored prosperity to the city, and by 1860, at the start of the Civil War, San Antonio had grown to a city of 15,000 people. This period saw a large immigration from Germany. The beautiful King William district just south of downtown was built at this time as the home to the most successful of the city’s German merchants. During this period a visitor was as likely to hear German as English or Spanish, spoken on the streets of the city. The Guenther Flour Mills, Gebhardt’s Chili Powder, and Mahncke Park, are just a few of the local institutions which recall San Antonio’s German heritage. During the Civil War San Antonio was not deeply involved in the secessionist cause, due in part to the fact that many of the city’s residents, notably those of German or Mexican ancestry, supported the Union. After the war San Antonio prospered as a center of the cattle culture. There is an argument to be made that it was in San Antonio that the American cowboy originated, since it was there that Spanish and Mexican techniques of herding cattle on horseback were transferred to anglo American cattle ranchers. It is undoubted that major cattle trails, including the Chisholm Trail, began in San Antonio. It was for this reason that promoter “Bet a Million” Gates chose San Antonio to demonstrate the value of barbed wire. In 1876 he fenced off Alamo Plaza with the new invention then had cowboys drive a herd of cattle into the wire. When the wire held the cattle many of the ranchers in attendance placed orders for the new product. San Antonio was thus crucial both to the beginning and ending of the open range period in American ranching culture. During this period San Antonio remained a frontier city. Its isolation and its diverse cultures gave it the reputation as a beautiful and exotic place. When Frederick Law Olmstead, the architect who would two years later design Central Park in New York City, visited San Antonio in 1856 he described San Antonio as having a, “jumble of races, costumes, languages, and buildings,” which gave it a quality which only New Orleans could rival in, “odd and antiquated foreignness.” Much of the mystique which drives today’s tourist industry in San Antonio has it origins, then, in a sense of the uniqueness of the city which is over 150 years old.In 1877 the first railroad reached San Antonio and the city was no longer on the frontier but began to enter the mainstream of American society. At the beginning of the 20th century the streets of downtown, the old Spanish and Mexican city, were widened to accommodate street cars and modern traffic. In the process many historic building were destroyed. These included the Veramendi House, the home of the prominent family into which Jim Bowie had married when he came to city. Standing on the southwest side of the intersection of Houston and Soledad Streets this building was a massive quadrangle built of adobe around a central courtyard in the typical Mexican style. When the street was widened by 20 feet the building was leveled. Like many municipalities in the American Southwest, San Antonio experiences steady population growth. The city’s population has nearly doubled in 35 years, from just over 650,000 in the 1970 census to an estimated 1.2 million in 2005 through both steady population growth and land annexation (considerably enlarging the physical area of the city).